P. D. Ouspemsky (1878-1947) was a Russian mathematician, philosopher and esotericist, best known for his book, „In Search of the Miraculous: Fragments of an Unknown Teaching“, considered as the most comprehensive account of Gurdjieff‘s system of thought (The Fourth Way) ever published. 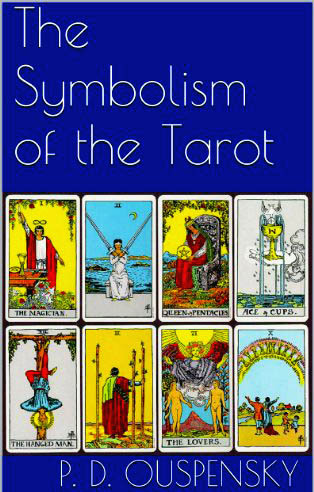 His book „The Symbolism of the Tarot“, written in 1913, before he met Gurdjieff and his ideas, was published in 1976: The Symbolism of the Tarot (Translated by A. L. Pogossky). New York: Dover Publications Inc., 1976. You can find HERE the online version. The subtitle of the book is „philosophy of occultism in pictures and numbers“. 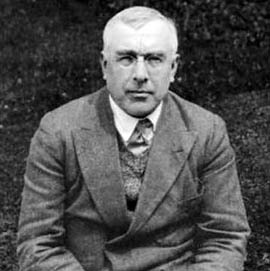 In his book about tarot, Ouspensky narrates an initiatic journey, during which he meets, understands and describes to his reader each of the 22 tarot major arcana (the first of them being The Magician, and the final one – The Hanged Man). 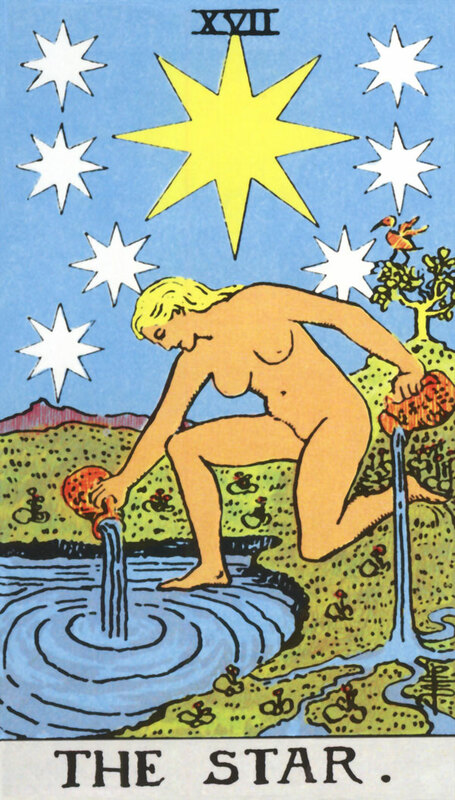 Here, we offer you, in one single place, a fragment for each Major Arcana, containing Ouspensky’s essential interpretation. THE WORLD: „It is the image of the world,“ the voice said, „but it can be understood only after the Temple has been entered. This is a vision of the world in the circle of Time, amidst the four principles. But thou seest differently because thou seest the world outside thyself. Learn to see it in thyself and thou wilt understand the infinite essence, hidden in all illusory forms. Understand that the world which thou knowest is only one of the aspects of the infinite world, and things and phenomena are merely hierolgyphics of deeper ideas“. THE EMPRESS: „Queen of life,” I said, “why is it so bright and joyful all about you? Do you not know of the grey, weary autumn, of the cold, white winter? Do you not know of death and graveyards with black graves, damp and cold? How can you smile so joyfully on the opening flowers, when everything is destined to death, even that which has not yet been born?” For answer the Empress looked on me still smiling and, under the influence of that smile, I suddenly felt a flower of some clear understanding open in my heart“. THE JUDGEMENT: „ Two fiery wings suddenly expanded in the cloud, and I knew that I beheld the messenger of the Empress. […] He raised a trumpet and blew through it vibrant, powerful tones. […] And in its tones I felt the smile of the Empress and in the opening graves I saw the opening flowers whose fragrance seemed to be wafted by the outstretched arms. Then I understood the mystery of birth in death“. THE EMPEROR: „I am the beginning; I am action; I am completion; I am the result. For him who knows how to see me there are no mysteries on earth. I am the great Pentacle. 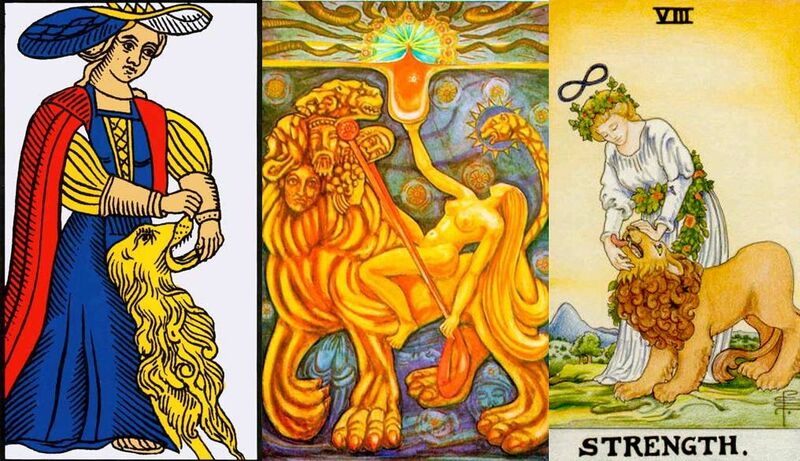 As the earth encloses in itself fire, water and air; as the fourth letter of the Name encloses in itself the first three and becomes itself the first, so my sceptre encloses the complete triangle and bears in itself the seed of a new triangle. I am the Logos in the full aspect and the beginning of a new Logos“. THE SUN: „I shut my eyes for a moment and when I opened them again I saw that each ray of the Sun is the sceptre of the Emperor and bears life. And I saw how under the concentration of these rays the mystic flowers of the waters open and receive the rays into themselves and how all Nature is constantly born from the union of two principles“. THE CHARIOT: „He entered the outer court of the Temple of knowledge, but thinks he has been in the Temple itself. He regarded the rituals of the first tests as initiation, and he mistook for the goddess, the priestess who guarded the threshold. Because of this misconception great perils await him. Nevertheless it may be that even in his errors and perils the Great Conception lies concealed. He seeks to know and, perhaps, in order to attain, mistakes, dangers and even failures are necessary. Understand that this is the same man whom you saw uniting Heaven and Earth, and again walking across a hot desert to a precipice“. THE MOON: „I sensed the presence of a mysterious world, a world of hostile spirits, of corpses rising from graves, of wailing ghosts. In this pale moonlight I seemed to feel the presence of apparitions; someone watched me from behind the towers,–and I knew it was dangerous to look back“. THE LOVERS: „The everlasting mistake with men is that they see the fall in love. But Love is not a fall, it is a soaring above an abyss. And the higher the flight, the more beautiful and alluring appears the earth. But that wisdom, which crawls on earth, advises belief in the earth and in the present. This is the Temptation. And the man and woman yielded to it. They dropped from the eternal realms and submitted to time and death. The balance was disturbed. The fairyland was closed upon them. The elves, undines, sylphs and gnomes became invisible. The Face of God ceased to reveal Itself to them, and all things appeared upside down. “This Fall, this first ‘sin of man’, repeats itself perpetually, because man continues to believe in his separateness and in the Present. And only by means of great suffering can he liberate himself from the control of time and return to Eternity–leave darkness and return to Light“. THE STAR: „For a moment I understood that I beheld the Soul of Nature. “This is Nature’s Imagination,” said the voice gently. “Nature dreams, improvises, creates worlds. Learn to unite your imagination with Her Imagination and nothing will ever be impossible for you. Lose the external world and seek it in yourself. Then you will find Light. “But remember, unless you have lost the Earth, you will not find Heaven. It is impossible to see both wrongly and rightly at the same time.”“. THE HIEROPHANT: „Seek the Path, do not seek attainment, Seek for the Path within yourself. Do not expect to hear the truth from others, nor to see it, or read it in books. Look for the truth in yourself, not without yourself. […]The Path is in yourself, and Truth is in yourself and Mystery is in yourself“. THE TOWER: „The building of the tower was begun by the disciples of the great Master in order to have a constant reminder of the Master’s teaching that the true tower must be built in one’s own soul, that in the tower built by hands there can be no mysteries, that no one can ascend to Heaven by treading stone steps. The tower should warn the people not to believe in it. It should serve as a reminder of the inner Temple and as a protection against the outer; it should be as a lighthouse, in a dangerous place where men have often been wrecked and where ships should not go“. POWER: „This is a picture of power, said the voice. It has different meanings. First it shows the power of love. Love alone can conquer wrath. Hatred feeds hatred. Remember what Zarathustra said: “Let man be freed from vengeance; this is a bridge for me which leads to higher hope and a rainbow in heaven after long storms. Then it shows power of unity. These wreaths of roses suggest a magic chain. Unity of desires, unity of aspirations creates such power that every wild, uncontrolled, unconscious force is subdued. Even two desires, if united, are able to conquer almost the whole world. The picture also shows the power of infinity, that sphere of mysteries. For a consciousness that perceives the symbol of infinity above it, knows no obstacles and cannot be withstood“. THE DEVIL: „I am Evil, he said, at least so far as Evil can exist in this best of worlds. In order to see me, one must be able to see unfairly, incorrectly and narrowly. I close the triangle, the other two sides of which are Death and Time. In order to quit this triangle it is necessary to see that it does not exist. But how to do this is not for me to tell. For I am the Evil which men say is the cause of all evil and which they invented as an excuse for all the evil that they do. They call me the Prince of Falsehood, and truly I am the prince of lies, because I am the most monstrous production of human lies“. THE HERMIT: „The lantern, the cloak and the staff are the three symbols of initiation. They are needed to guide souls past the temptation of illusory fires by the roadside, so that they may go straight to the higher goal. He who receives these three symbols or aspires to obtain them, strives to enrich himself with all he can acquire, not for himself, but, like God, to delight in the joy of giving. The giving virtue is the basis of an initiate’s life“. TIME (TEMPERANCE): „The name of the angel is Time. The circle on his forehead is the symbol of eternity and life. Each life is a circle which returns to the same point where it began. Death is the return to birth. And from one point to another on the circumference of a circle the distance is always the same, and the further it is from one point, the nearer it will be to the other. Eternity is a serpent, pursuing its tail, never catching it. One of the cups the angel holds is the past, the other is the future. The rainbow stream between the cups is the present. You see that it flows both ways. This is Time in its most incomprehensible aspect“. 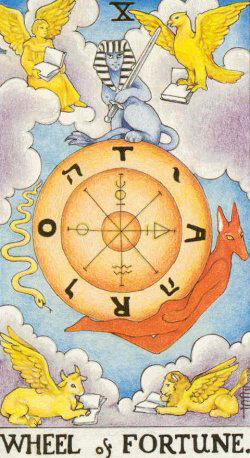 THE WHEEL OF CHANCE: „«All go, all return», – the wheel of life ever turns. All die, all flourish again,–the year of existence runs eternally. All perish, all live again, the same house of existence is ever building. All separate, all meet again, the ring of existence is ever true to itself. Existence begins at every moment. Round each «here» rolls «there». The middle is everywhere. The way of eternity is a curve“. JUSTICE: „You see Truth,” said the voice. 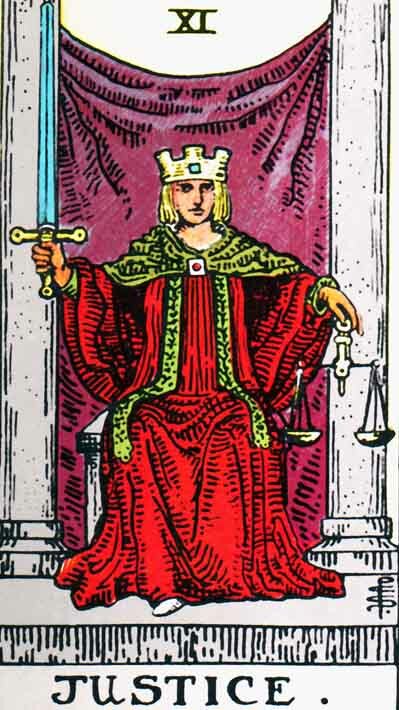 “On these scales everything is weighed. This sword is always raised to guard justice, and nothing can escape it. But why do you avert your eyes from the scales and the sword? They will remove the last illusions. How could you live on earth without these illusions? You wished to see Truth and now you behold it! But remember what happens to the mortal who beholds a Goddess!“. THE HANGED MAN: „Look! This is a man who saw Truth. Suffering awaits the man on earth, who finds the way to eternity and to the understanding of the Endless. He is still a man, but he already knows much of what is inaccessible even to Gods. And the incommensurableness of the small and the great in his soul constitutes his pain and his golgotha. In his own soul appears the gallows on which he hangs in suffering, feeling that he is indeed inverted. He chose this way himself. For this he went over a long road from trial to trial, from initiation to initiation, through failures and falls. And now he has found Truth and knows himself“. 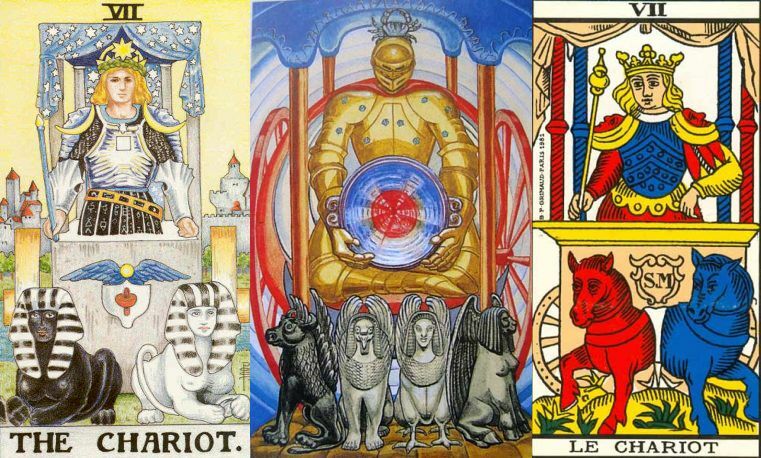 Share the post "Major Arcana Tarot Card Essential Meanings, according to P. D. Ouspensky"